People Before Profit have called on people to turn out in force for the National Homelessness and Housing Coalition demonstration on Saturday (2pm, Garden of Remembrance). 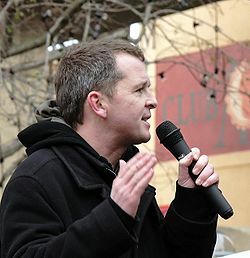 Dún Laoghaire TD Richard Boyd Barrett who is one of the organisers of the demonstration said that the housing and homelessness crisis was not getting any better despite countless plans and announcements by Fine Gael led governments over the last number of years. The TD pointed out that the anti-water charges campaign was the model that the group were looking to follow and said that the success of that campaign was centred around a number of mass mobilisations which shook the government into action. “We are calling on people to get out on the streets this Saturday to demonstrate their anger at the government so that we can shake them into action. “The housing and homelessness crisis remains the most pressing issue facing us a society. It is not getting any better and in many cases, it is getting much worse. “Fine Gael policy has not improved the housing and homelessness landscape in any way. Their obsession with the private sector, their policy of allowing NAMA to sell tens of billions of property assets to international property speculators have fuelled the current housing crisis, driven up rents and property prices out of control. “The water charges model is the model that we want to follow because it is what the establishment fear- the mass mobilisation of people power.